Is it Time for a Kitchen Redesign? Home > Blog > Kitchen Remodeling > Is it Time for a Kitchen Redesign? Do you think it’s time for a kitchen redesign? If your home was built more than three decades ago, it is probably time to look into kitchen remodeling options. However, if you’re unsure, we have created this kitchen redesign checklist to help you determine if now is the time. Right now, beauty equals functionality in the kitchen. For starters, counter surfaces have changed significantly. In the 80’s, white or cream-colored laminate counters were predominant, along with ceramic tile counters set with bull-nose wood edges. Today, quartz and granite offer easy to maintain work surfaces. Additionally, stone counters add beauty and are much more durable than tile and laminate products. Faucets are much more functional now with sprays that are part of the overall unit, pivoting goosenecks for filling large pots and user-friendly, modern-looking handles. Lighting has also changed with the advent of LED and halogen bulbs. And pendant and task lighting over specific work areas are replacing those large fluorescent lights in the center of the kitchen ceiling. If your kitchen was built before the 80s, it is possible it was designed for “one” cook. It is also likely separate from your dining area. Today, many families’ cook together and people tend to gather in the kitchen. Now, formal dining rooms are converting into extensions of the kitchen where people can dine both every day and on special occasions when visitors come to the home. More than 30 years ago, the Internet was only in its infancy. Fast forward to today, computers have changed the way many of us live, and they have found their way into the kitchen. Smart appliances with microchips allow us to add new features to our kitchens. These appliances are much more energy efficient and offer a broader and more diverse range of functions. Now, kitchen essentials include ovens with convection baking and roasting features; Energy Star qualified refrigerators; microwaves with sensor features that serve as a second oven; Energy Star dishwashers, with drawer-style dishwashers; under-cabinet refrigeration units; wine coolers; flat-screen TVs; and, so on. Many kitchen cabinet styles signify the era in which a home was built. For instance, in the 1980s, oak and white laminate cabinets with oak trim were popular. Are your cabinet doors warped, shelves bowed, glides off drawers, or the cabinets near your stovetop stained with grease? It may be time for a kitchen redesign. Perhaps you just bought your house and the kitchen’s current style does not align with your tastes. If you find yourself dreaming of what your kitchen could be like, then you might find it is time to look into custom remodeling options. 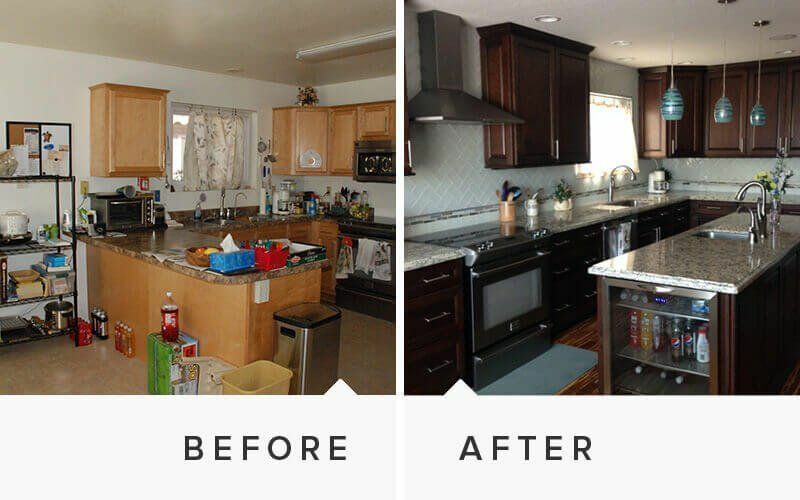 As a premier kitchen remodeling company in Phoenix, Arizona. We stay on top of all the latest trends and technological advancements in the kitchen redesign industry. If you think your kitchen is behind the times, contact us today to schedule a free consultation.